THEY LEGALIZED IT! LET’S CELEBRATE! 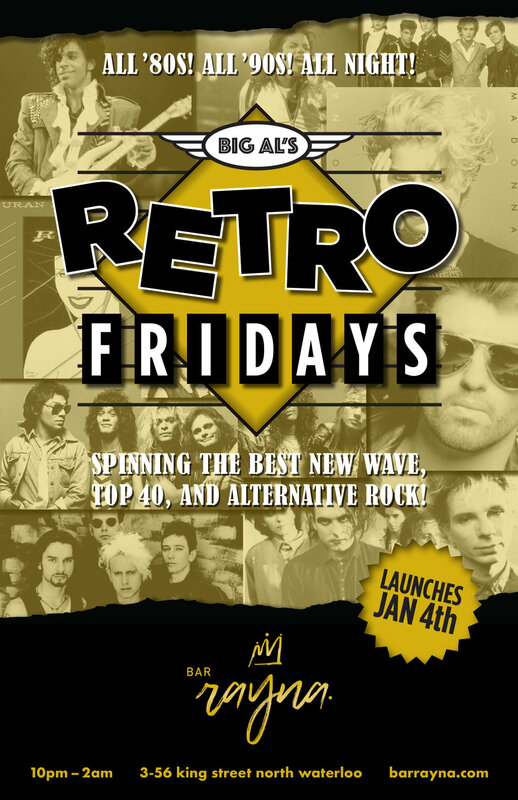 RETRO FRIDAYS are launching officially JANUARY 4th. .
DJ Big Al - the one and only Friday Night DJ at the legendary Club Abstract is back! Spinning the best new wave, top 40 hits & Alternative Rock from the 80’s , 90’s.& 2000's. If you remember Abstract Friday’s then just wait until you see what our Rayna family has in store for you. Look for Vic, he'll be greeting you at the front door! See you on the 4th! Stuck working ANOTHER New Years?! Don’t worry, we got you covered. Feel like celebrating New Years TWICE?! We also got you covered. We’re hosting a New Years bash 2.0 for all you hard working, drink slinging friends that missed another midnight countdown and champagne bottle popping. We’ve also got special bottle service prices. $165 ALL IN for Hennessy, Belvedere, Ciroc or Grey Goose! LIMITED GUEST LIST UNTIL 11PM, CLICK ON LINK BELOW TO GET ON THE LIST! 1. Guest must provide full name and number of expected guests arriving together. All Guests must be 19+ Wednesday & Thursday and 21+ Friday & Saturday 2. Guest List closes at 11:30 or once capacity is reached, if not at capacity cover charge will apply after 11.30 pm 3. Guest List provides priority entry BUT does not guarantee entry. Bottle service reservations, Owners Guest List, are placed in priority sequence of website requests. Once capacity is reached a one out one in policy will be implemented without negotiation and cover charge will be implemented . Bar Rayna encourages all to come early and avoid disappointment. Thank you! Our Reservations Manager will contact you shortly. 1. Full Name and Credit Card Number must be provided along with number of guests in reservation. We will also require an email address and phone number. 2. A Minimum of 24 hour notice for cancellation is required to obtain a full refund 3. Parties must arrive by 11:30 pm 4. Booth Reservations for 8 to 10 guests must have a min 2 bottle spend, High Top/Bar Top Reservations for up to 4 guests must have min 1 bottle spend. Sign me up for Bar Rayna's Newletter! Thank you! Our Reservations Manager will contact you shortly to complete your reservation! Join us in celebrating Big D’s Birthday! Coinciding with the Final Night of our Grand Opening - 2 Weekend Extravaganza we anticipate this to be a busy night! Grab your VIP passes at BAR RAYNA or WHITE RABBIT and register them here. Interested in Bottle Service? Click the button below to get in touch with our Reservation Manager and he’ll hook you up! 2 MORE NIGHTS ADDED TO OUR GRAND OPENING EXTRAVAGANZA DUE TO HIGH DEMAND! VIP passes available at the WHITE RABBIT and BAR RAYNA or contact RSVP@barrayna.com to secure yours while you can, limited number of passes.